Lovely property in a georgeous area. Stay was everything we had hoped for. Restful, convenient, close to some the most beautiful beaches. Look forward to returning. When I did call I was given prompt information and received a quick call back. The property we stayed in was very well kept up and lacked nothing with the exception of kleenex and dish washing soap. Kim was great to work with as always. Working with Kim was so easy. Kim promptness and friendly attitude made our last minute trip stress free. We literally booked 6 hours before we arrived but Kim helped us feel at ease. She is truly an asset to the company. We couldn't have been in better hands. Thank you! The team at Resortica was very helpful and made the booking experience simple! This was our first experience staying in a condo and we were very pleased! C1 is a wonderful property! We would stay again! One member of our party left behind her fitness tracker ans staff were very efficient in locating it, shipping it to her home, and keeping her informed via email at every step in the process. This was our first experience in renting a condo for a two week vacation and definitely a splurge for us. However, by sharing the costs with another couple and eating in frequently, we actually found the condo to be quite cost-effective. The layout of the unit with the bedrooms at opposite ends was perfect for two couples. We had lots of privacy combined with large common areas. 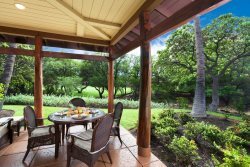 Waikoloa Villas exceeded our expectations in every way. Overall, the resort was impeccably maintained-kudos to the staff. Hospitality if obviously your top priority. Overall the apartment was wonderful, everything we needed, quiet and relaxing. Wendy was very nice, helpful and having groceries delivered to our property and a snorkel trip booked for us while we just settled in was greatly appreciated. Fairways Mauna Lani #206 could not have been better. The pool was extraordinary, the small intimate layout of the entire property was quiet and the perfect vacation setting. We loved being able to park our rental car in the garage. The grounds and care that the workers put in around the property does not go unnoticed. Thank you from Cathy, Wade, Wyatt and Amy Mowat of New Norway, AB Canada. Staff was very friendly, helpful and prompt in responding. We had a very enjoyable time, construction workers off for four straight days, so that helped keep it quiet. They were all good. Very friendly. The holidays caused them to be gone a bit of the time we were there, but we understand. Highly recommend our condo to anyone. The pool and hot tub was just across the street from our place, location was good and we enjoyed sitting on our deck and watching the golfers as we ate our breakfast in the mornings. All was excellent. Anne Marie and the team were great. We will definitely be using your firm on future trips to Hawaii. The condo was well appointed with both housewares and pool / beach toys. We enjoyed our stay and highly recommend unit D-1. Every interaction with your team was extent. I injured my ankle at the end of our trip and need to setup a late checkout at the last minute. Your team was able to accommodate me and it was greatly appreciated. The condo A2 we stayed far exceeded our expectations and was one of the first places that made me really feel at home. I own another vacation home and your property made me feel like I was just returning to my property.